Welcome to the DAGStat Conference 2019! The fifth conference of the Deutsche Arbeitsgemeinschaft Statistik will take place in the heart of the Bavarian capital, Munich, from March 18 - 22, 2019. 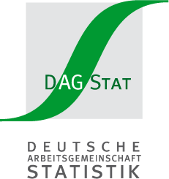 According to the motto "Statistics under one umbrella" the conference is organized as a joint meeting of the "Deutsche Arbeitsgemeinschaft Statistik". The meeting includes the 65th "Biometrisches Kolloquium" and the Spring Meeting of the "Deutsche Statistische Gesellschaft". January 31: The conference programme is now online click here. January 30: The early-bird registration ended. Online, late-bird registration is still possible until March 10th. After March 10th no online registration will be possible. However, there will be the possibility of an on-site registration during the conference, beginning March 18th. The DAGStat 2019 is closely connected to the European Confrence on Data Analysis (ECDA2019) in Bayreuth which takes place on 18th – 20th March, 2019. The ECDA2019 stands under the motto „Multidisciplinary Facets of Data Science“ and will pay special emphasis on interdisciplinary research and the interaction of theory and practice. Bayreuth is close to Munich so a visit to both confrences can be recomended. For further information please visit the website of ECDA2019. Participants of ECDA2019 may pay the DAGStat fee, regardless of whether they are member of a DAGStat society. A full time registration of ECDA2019 is required and has to be shown at the registration desk. The links below will provide you with all relevant information on the DAGStat Conference 2019.